Is it possible to be attracting money? Posted on February 3, 2015 by Financial Underdog	in Uncategorized. Personally, I’m not a superstitious person. My wife isn’t one either, but we do share couple of superstitions between us which we stick to for some reason. Perhaps we’ve inherited them from our parents. After all, kids do what parents do without questioning it. My wife’s superstition is somewhat cool. 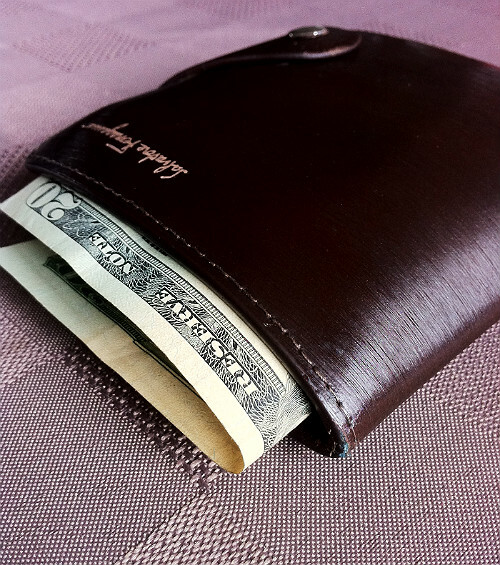 If she ever gives somebody a wallet as a present, she always puts money into it. Some people consider giving an empty wallet a sign of bad luck – if you give an empty wallet, it will stay empty. At the same time, if you put some money into it and hold on to it, this money will be attracting money for you and making you wealthier as the time passes. So, she always puts $5 or $10 dollars inside a wallet before gifting it. I’ve received two wallets from her as a gift over the years, and both contained money. For the last 4 years since she gave my current wallet as a gift, I’ve been walking around with a $20 bill tucked away inside of it. She laughed a little when explaining it to me the first time, and said it’s all stupid, but her mom has always been doing it, so she does the same thing now. Monkey see, monkey do! Attracting money? Come on, get real. Remember that awful movie “The Secret” about attracting success, money, and fame? It was more like a giant movement that included movies, books, instructional videos, classes, and even exclusive retreats for people who wanted to attract things in their lives. If I remember correctly, you had to open up to the magical forces in the universe and ask for things you desire and they’d appear before you for the taking. You know, money would start falling on you wherever you go, Jennifer Aniston would knock on your door asking if you know how to change tires, and your boss would give you a promotion. Besides attracting great deal of money for the authors of this junk, I don’t think there is much attracting going on. One of my friends gave me the book on Law of Attraction saying it’s the greatest book ever printed, and I’ve read it from cover to cover without much result except for wondering why I am friends with this guy. Seriously, waking up every day and imagining yourself being wealthy will make you wealthy? And here’s when you say – well, your wife’s superstition about attracting money by putting money into your wallet isn’t much different, is it? Money hasn’t been sneaking into my wallet everywhere I go, I admit. The $20 bill I keep carrying around doesn’t multiply every time I open my wallet. Cause if it was, I’d be opening and closing my wallet all day long instead of going to work. And yet, I’ve started to think it’s actually attracting money…sort of. Have you ever been given an egg in class to take care as an assignment? I don’t know if kids still do it these days, but I remember doing it in school. Your teacher gives you an egg, and you carry it with you for a few days. You have to make sure you don’t accidentally sit on it, you pack it properly in your school bag, and you carry it with you everywhere. Supposedly, it teaches kids to be responsible and pay attention to something for longer than five minutes. Do kids do it in Canada? Or do they have an app for it? Anyways, what if you think about that $20 bill given to you along with the wallet as the proverbial egg? If you’re not supposed to spend it, it means you have to practice the discipline everywhere you go. You have to say no to impulse buys even though you have a crispy $20 bill in your wallet. You have to make sure you always have enough money and plan ahead because that $20 bill can’t be used to cover the difference if you’re wrong. More importantly, you have to say “NO” to yourself constantly and refuse to buy needless things despite having money for it. Would this in turn make you more financially successful? Would it be attracting money in a way? Will you be financially better off if you learn to be responsible with measly $20? Won’t you learn to be responsible with money and spend it wisely as a result? The idea of attracting money sounds absolutely dumb, but the idea of teaching yourself to be responsible through this little exercise of willpower has a merit, don’t you think? We are a young couple and don’t make a great deal of money, but we always manage to set money aside. Our net worth keeps growing year after year. We’ve learned to be responsible with what little money we have, and in a way, we are attracting money. We budget, we spend wisely, and we invest our money for growth. And it all starts with just a $20 bill in your wallet and an old superstition. PS: Do you have any money superstitions?